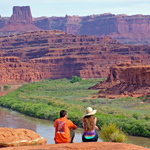 Our hometown, Moab, Utah is known as the “Adventure Capital” of the southwest, for good reason! Moab provides easy access to world-class outdoor activities including mountain biking, jeep tours, canyoneering, rock climbing, and hiking in Arches National Park, Canyonlands National Park, and Dead Horse Point State Park. 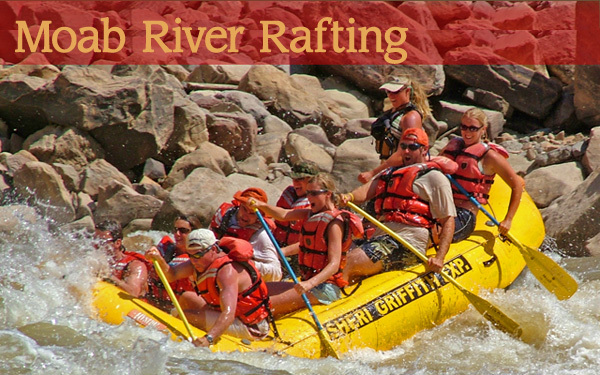 But, most importantly, Moab’s long tradition of whitewater rafting and physical location make it the perfect base for your river trip! 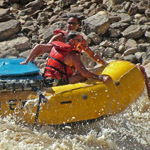 Moab is the birthplace of whitewater rafting in Utah, and we’ve spent countlesstrips over the past four decades perfecting each and every one of our trips, which means you will have an unforgettable experience no matter what trip you choose. 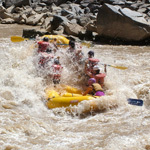 Moab’s proximity to world-class rivers is also unparalleled. Whether you have a day, a weekend, or a week or more; you’ll find that Moab is a great base for your trip. 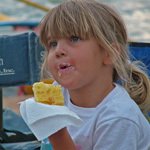 For example, both Fisher Towers and Cataract Canyon, two of our most popular trips, are only 30 minutes away. Desolation Canyon is a 45-minute scenic flight; while our sea kaying trip through Labyrinth Canyon is less than an hour away. Our longest drive, to Westwater Canyon, is only an hour and a half away, and is one of our most popular day trips! 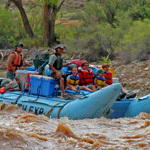 Moab River Trips Sheri Griffith River Expeditions runs. 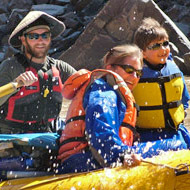 Majestic Canyons: This 5 day trip in Desolation Canyon on the Green River is perfect for families. Highlights include fun whitewater, enchanting campsites on sandy beaches, a river temperature perfect for swimming, stunning geology and cultural history, and a scenic flight to the launch site! 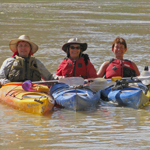 Labyrinth Canyon: These 5-6 day trips on the Green River offer a graceful float through spectacular scenery on the longest stretch of un-dammed flat water in the southwest. Highlights include spectacular geology, scenic side hikes to ancient Native American writings and trapper’s inscriptions, and the tranquility of this magnificent canyon.